GC Engineering, Inc. (GCE) prepared final designs for traffic signal installations and modifications as part of a design team led by another company. The proposed design includes a 4-lane concrete boulevard section. GCE also conducted a hydrologic and hydraulic analysis, waterline design, traffic study and preparation of a preliminary design report for the improvements, as well as preparation of final design plans and contract documents. As part of the preliminary drainage analysis, GCE carried out a drainage alternative analysis consisting of three alternatives for the project. Upon selection of the preferred alternative, GCE carried out a detailed H&H analysis for the selected alternative. Existing HEC-HMS and HEC-RAS models were updated to study any impacts due to proposed improvements. Steady flow and unsteady flow simulations were performed using HEC-RAS to determine the peak flows and water surface elevations for various offsite storm water detention alternatives to achieve no impact conditions. Work also included a Traffic Signal Warrant Study at five intersections, traffic signal design, and preparation of Preliminary Engineering Reports that included preliminary plans, final construction plans and bid documents for the project. 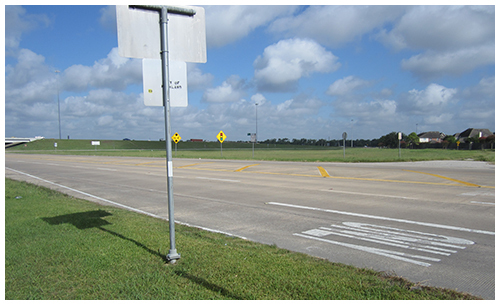 GCE coordinated the project with City of Pearland, Brazoria Drainage District No. 4, TxDOT and other agencies to ensure that all requirements are accommodated in the project design.